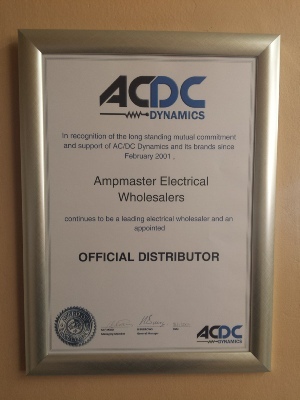 Ampmaster specialises in the distribution of electrical materials to the industrial and domestic markets. Ampmaster aims to expand our customer base to more sectors of the economy by offering technically advanced products with emphasis on power saving solutions. 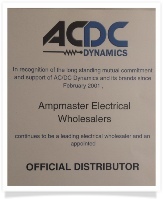 Ampmaster was established in 1982 by Neville Koch as a sole proprietor. The business steadily outgrew the small office where it all started and soon had to move into a larger warehouse in Pretoria West. His older son Owen joined the company in 1986 and Clifford, the youngest son, joined in 1992. Sadly Clifford, known fondly as “Chappie”, passed away in 1997 due to a motorcycle accident. Neville decided to retire in 1998 and Owen became the sole member of Ampmaster. Being in the business for so many years he has acquired considerable knowledge and experience in the electrical industry. Ampmaster strives to improve the quality of life for our employees as well as benefiting our local community by honoring our social commitment. We have a process of training previously disadvantaged employees, so that they can achieve higher positions within the company. PDI are given preference to the employment process.